A schoolyard bully is enlightened by the new kid in class in this lively story about the power of kindness and friendship. "Mean Jean was Recess Queen/ and nobody said any different," the tale begins. Each day at recess, Mean Jean blasts through the playground . . . No one dares cross her path: "She'd push 'em and smoosh 'em, lollapaloosh 'em." But when tiny Katie Sue, a new student, arrives, all bets are off. . . Her role usurped, Mean Jean moves toward a meltdown, until Katie Sue makes her an offer she finds difficult to refuse: an invitation to play together. Told in a rollicking rhyme, the story offers a lighthearted look at a serious topic in schools and on playgrounds everywhere - the bully. Katie Sue puts Mean Jean in her place in a surprisingly easy way - simply by being too new to know any better. In a nice twist, when confronted by Mean Jean, instead of backing away, the newcomer invites her to play. Both the text and the art are smart, sassy, and energetic. The text effectively dips, swirls, and slants around the action of the art, further marrying the two. A schoolyard bully is enlightened by the new kid in class in this lively story about the power of kindness and friendship. O'Neill's text brims with fun-to-say phrases that fit a rollicking rhythm, and her assessment of recess dynamics feels authentic. O'Neill puts seemingly meek, new classmate Katie Sue up against aggressive Mean Jean, swaggering boss of the playground. But Katie Sue stands up to her with a cheeky, "How DID you get to be so bossy?" and pulls out a jump rope, inviting Mean Jean to jump along. Presto change-o, a friendship is born. Huliska-Beith's rubbery-limbed figures, rolling perspectives, and neon-bright colors reflect the text's informality as well as its frenzied energy. Young readers will be caught up by Katie Sue's engaging, fizzy exuberance. The ability to offhandedly deflate a bully, with neither animosity nor remorse, is my idea of heaven — and is high on my wish list for my daughters. This snappily told story of unwavering self-worth and the power of cheerful assertion gives us hope — and lots of laughs. 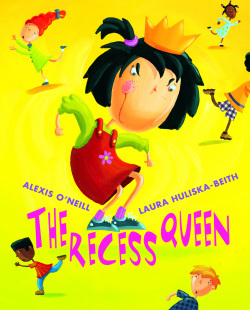 Listen to The Recess Queen in French!